Clouds of uncertainty continue to hover over the salaries of Air India employees. A huge debt burden and strained finances have forced the national carrier to delay payments for the second consecutive month. Image: AI has a huge debt burden. Its employees, totalling 31,000, have not yet received salaries for January, which normally come by the last day of every month. 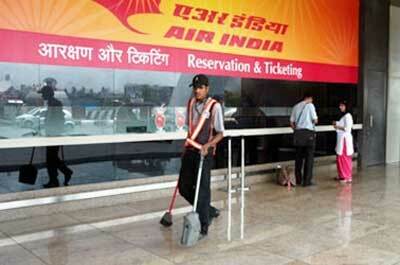 "Last month, Air India paid the salaries by January 7, but the payment for this month seems unlikely to come by then. The airline does not have money to pay salaries, as the banks are reluctant to increase working capital loans," said a senior civil aviation ministry official, who did not want to be identified. 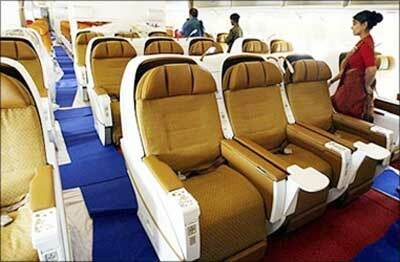 Image: Interior view of Air India flight. 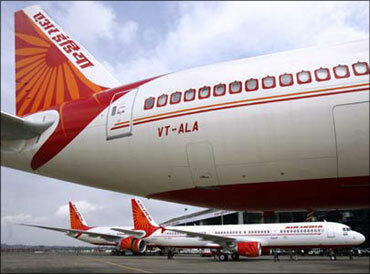 The official explained that out of the Rs 22 crore (Rs 220 million) Air India earns every day, Rs 13.5 crore go to the oil companies and Rs 8 crore (Rs 80 million) to the airport operator and ground handlers and spare parts companies, leaving the airline with only Rs 50 lakh a day. This translates into only Rs 15 crore (Rs 150 million) a month. 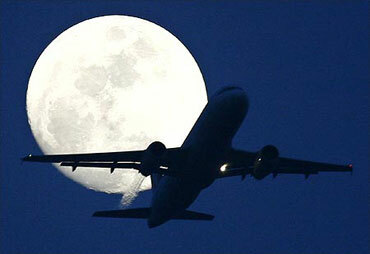 The monthly wage bill of the airline is about Rs 250 crore (Rs 2.5 billion). The carrier, with accumulated losses of over Rs 15,000 crore (Rs 150 billion), wants to freeze pay and promotions for its employees for three years. It has an annual wage bill of Rs 3,100 crore (Rs 31 billion) and will see 2,600 employees retire by 2014. The oil companies put Air India's oil requirements on cash and carry after it defaulted on payments. "The situation was more serious before the airline got the second equity infusion of Rs 1,200 crore (Rs 12 billion), which eased the daily payments to oil companies from Rs 17.5 crore (to Rs 13.5 crore now). The airline could not do much with the Rs 1,200 crore equity infusion as that was with a condition to pay Rs 500 crore (Rs 5 billion) each to oil companies and service debt. The rest Rs 200 crore (Rs 2 billion) Went to spare parts manufacturers," the official said. These financial problems have led to a sudden increase in the working capital debt of the airline. "The increase of the working capital debt of the airline from Rs 19,000 crore (Rs 190 billion) to Rs 21,000 crore (Rs 210 billion) in a short period speaks volumes about the trouble the airline is in," said the official. The carrier's working capital debt of Rs 21,000 crore carries an interest burden of 12 per cent. 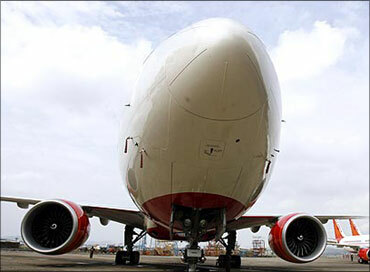 AI's annual interest payment is Rs 1,800 crore (Rs 18 billion) on a debt of over Rs 40,000 crore (Rs 21,000 crore is the working capital debt and the rest low-cost debt taken primarily to buy aircraft). 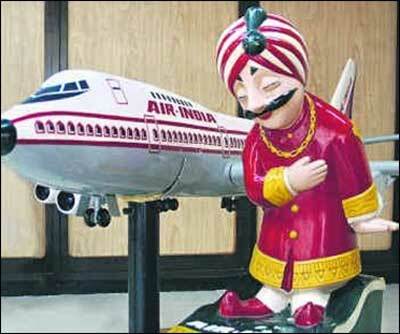 Image: Air India ticketing counter. "The airline can only be revived if the government infuses huge money. Any infusion in the range of what was given in the past will not be of much use," said the official. 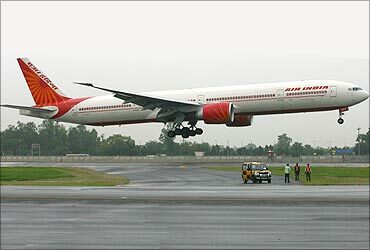 In its attempt to bail out Air India, the government recently injected two tranches of Rs 1,200 crore and Rs 800 crore (Rs 8 billion) in 2009-10, raising the equity base to Rs 2,145 crore (Rs 21.45 billion).